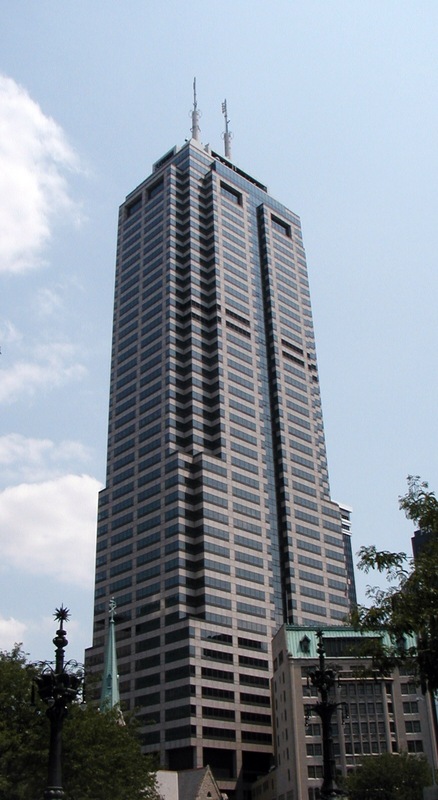 Chase Tower in Indianapolis is stands 811 feet and 49 stories high. It is located at 111 Monument Circle. This postmodern skyscraper, designed by KlingStubbins is made of steel with a granite and curtain wall façade. Its construction began in 1987 and was completed in 1990. The building was originally known as American Fletcher Bank Tower, then later as Bank One Tower. 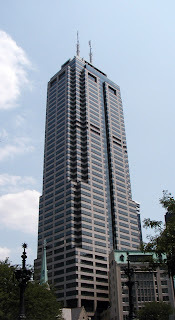 Its name was changed to Chase Tower in 2005 when JP Morgan Chase acquired Bank One. The top of the tower is distinguished by a step pyramidal design congruent with the nearby Indiana War Memorial. One of the spires functions as a communications antenna, but the other was only added for aesthetic value. See my detailed article of when I ran the stairs of Chase Tower.